This completely modular program is tailored to corporate and site-specific needs. Our progressive hands-on training methods guarantee increased retention, motivation and a superior safety attitude. As regulations, standards and corporate policies change, Global Training Centre’s capability to implement immediate revisions ensures our training reflects the most current technology, generally considered above OH&S regulations and standards. The extensive experience and specialized skills of our team allows us to customize this program at the highest level of quality to satisfy your requirements. Why is there a need for Safety 2000®? The Global or Open Safety 2000® program was initiated by industry to address regulatory training by companies that wish to co-train with other companies for learning enrichment, and a higher quality of training and product. The Corporate-Specific Safety 2000® program addresses the needs of companies that require the addition of company and site-specific information to enhance personnel development, as well as increasing due diligence demands. How often is Safety 2000® offered? The Safety 2000® program runs weekly, year round, beginning each Monday at 7:00 am. The Summer Student Safety 2000 is scheduled APRIL 22-25, 2019 and costs $1,165.00 per student. Courses included in Safety 2000® offered? This course gives participants the opportunity to receive the advanced means and knowledge to correctly identify a confined space, and the hazards, equipment and preparation required to meet the legislation. The focus is aimed at educating rescue teams or personnel working in confined spaces of their responsibilities in a confined space situation, beginning with Confined Space Legislation. Participants learn how to identify a confined space and how to prepare for entry. They will learn how to test and measure the atmosphere, how to identify the physical hazards and what protective equipment to wear. Qualifications and responsibilities of workers prior to entry is spelled out and the necessary permits reviewed. Participants complete a practical exercise on vessel isolation and lockout procedures on a typical vessel. Objectives are tested by written competency exam, which participants must achieve a minimum 70% to pass. Certification, valid for three years, is issued upon completion of objectives. This course gives participants the opportunity to receive advanced means and knowledge to safely retrieve fallen workers, and is aimed at training rescue teams or personnel working in confined spaces. The emphasis is placed on equipment and techniques that enable them to quickly implement an efficient rescue in a variety of situations. Topics covered and practiced are rescue procedures and planning, as well as the sequence of events and rescue equipment needed by both the rescuer and the casualties. The objectives to this course are obtained through 100% participation; therefore, the candidate must be physically and mentally able to perform the tasks from an elevated position. Certification, valid for three years, is issued on completion of objectives. Participants learn their limitations, the equipment’s limitations and common mistakes involved with gas testing. The course stresses the importance of a function test before operation of any gas monitor. Participant teams will function test and test all the above monitors (except the continuous monitor) for gas. The most common errors attributed to gas testing are explained. Participants are led through a typical function test, and learning what to look for when function testing. They are also taught proper testing techniques and how to test safely. This course teaches individuals to protect themselves in places where hydrogen sulphide may be present. 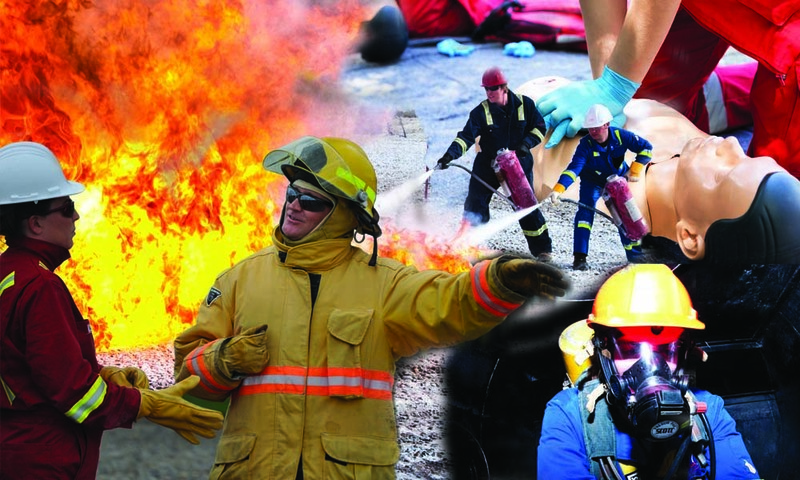 Participants must satisfactorily complete a written examination and demonstrate the skills taught, including operation and reading of detector tube devices, operation of self-contained breathing apparatus, rescue techniques and rescue breathing. Hydrogen sulphide case studies are analyzed noting toxic effects and common locations of H2S. Objectives are tested by both practical demonstration and written competency exam. Certification, valid for three years, is issued upon completion of objectives. This course takes into account that OELs for H2S were covered in the WHMIS course. The physical properties, toxicity levels, initial response scales and actual incident case studies are covered with each participant team analyzing their own case. Emphasis is on the proactive (i.e., “what went wrong and how you would prevent this from happening again?). Participants learn to identify a potentially toxic atmosphere, and how to eliminate it or work around it. They also learn about possible locations common for toxic atmospheres and emergency response strategies. This course explains what a hydrate is and how hydrate formation occurs. Emphasis is placed on the prevention and detection of hydrates. Participants are led through CAPP guidelines on hydrate handling, and learn an actual incident case study in which a fatality occurred due to a hydrate. Participants discover ways to be proactive rather than reactive, and learn about the nature and formation of hydrates, hydrate inhibition, prevention and detection. General precautions and the handling of hydrates is also covered. This course provides the necessary knowledge in the use, care and maintenance of a 30 lb. to 350 lb. fire extinguisher. The six-hour classroom theory covers aspects of the fire triangle, the chemical chain reaction, the classification and ratings of a fire extinguishers, dry chemical agents and additional extinguishment agents. Other topics include fire extinguishers (stored or cartridge-operated, 20 lb. to 350 lb. ), fire safety at home and the knowledge that fires will happen. Each participant goes through practical fire field evolutions, and successfully extinguishes eight fires with a 30 lb. dry chemical extinguisher and, as a team, successfully extinguishes three fires using 30 lb. extinguishers. The participant also successfully extinguishes a minimum 225 sq. ft. flammable liquid in depth, or equivalent pressurized gas, fire with a 350 lb. wheeled unit, and a minimum 225 sq. ft. flammable liquid in depth, or equivalent pressurized gas fire, in a team aspect under self-contained breathing apparatus. Objectives are tested by both practical demonstration and a written competency exam. Certification, valid for three years, is issued upon completion of objectives. This course provides participants with the most up-to-date information available on automotive safety. Each participant receives two hours of in-vehicle training that includes an evaluation to pinpoint their weak areas and coaching for improvement. Hands-on training in skid control using a specially designed and engineered skid car educates participants in how to deal with over-steering situations when the back end is catching up to the front end. Training is provided in control braking at 60 to 100 km per hour, a technique which that is simply the fastest, safest way to stop a vehicle. With training on both pavement and gravel, instruction includes dealing with under-steer situations when the car is plowing forward. Participants are given an eye test (for visual acuity, colour blindness and depth perception) and a reaction time test (to record the time it takes to react from the gas pedal to the brake pedal). An introduction to collision avoidance techniques is designed to help participants avoid obstacles on the road. An involved backing course teaches participants to properly use only the mirrors when backing up. Instructor commentary while driving teaches participants to keep their minds on the driving task. Participants receive a detailed written evaluation of the training, along with a grade and recommendation for further training, if required. The Alberta Occupational Health & Safety Act, Regulation and Code outline is introduced, and participants are given a Blue Book to use in class. This course is aimed at ensuring employees know that they – along with their employer – are responsible for the regulations. The course gives participants experience in sourcing information and understanding the regulations in the Blue Book. Topics covered include a general overview of workers and employers responsibilities, and focusing on how to use and find regulations. Participants also gain a firm understanding of OH&S regulations by researching the general safety regulations. This course gives participants basic knowledge in the use, care and maintenance of different types of respiratory protection, with emphasis on self-contained breathing apparatus. Participants are able to explain the types of respiratory protection, and define the need for respiratory protection and for a Code of Practice. They will also review their own corporate Code of Practice. Participants will clarify the components of SCBA and SABA, and demonstrate the proper donning and doffing of both a SCBA and SABA. Proper maintenance and storage of SCBAs and SABAs is covered. This course covers the essential modules required for first aid certification, while providing a unique first aid training concept that utilizes less theory and workbooks, and more scenarios and practical applications. The practical modules are unique in that participants respond to several mockups using live ‘casualties’. No other first aid course has been presented with such enthusiasm and motivation among participants! The focus is on recognition of life-threatening injuries, while learning to provide intervention until medical aid arrives. Participants demonstrate artificial respiration, how to help a choking victim, and how to deal with shock and unconsciousness. They learn to control severe bleeding, how to deal with fractures of upper and lower limbs, and proper first aid for head and spinal injuries. CPR for adult casualties is covered thoroughly. Objectives are tested by both practical demonstration and written competency exam. Certification, valid for three years, is issued on completion of objectives. This course is for individuals involved in the transportation and handling of dangerous goods. Topics include TDG legislation, classification, safety marks, documentation, safe handling, incident reporting and emergency response. Emphasis is placed on proper safety marks for items the participants would normally transport. Proper labeling, classification and vehicle inspection for TDG compliance is covered in detail. Objectives are tested by written competency exam. Certification, valid for three years, is issued on completion of objectives. This course covers the basics of WHMIS 2015, providing the participant with the skills to work safely around hazardous materials. The course is current and up to date with the Canadian legislative changes made on February 11, 2015. Covering the differences between WHMIS 1988 and WHMIS 2015, the course explains the transition period Canada is undergoing in order to comply with Globally Harmonized systems (GHS). The course covers worker education and workplace labeling, and emphasizes the importance of understanding Safety Data Sheets (SDS’s). The instructor will walk participants through a typical site-specific labeling session. Participants also gain an understanding of labeling systems for pipe, vessels and points of exposure.